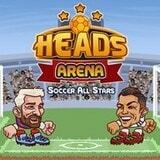 Battle on football arena in Heads Arena Soccer to the best football players from all world. The duel is conducted 1 on 1, therefore all hope is assigned only to you. Gate are located on a height to complicate game process.